Images are starting to drop. Headshots and Album 1 are up. We are trying to see if we can make video available also. Stay Tuned. See link for available images. Hey Kids–They’re Slingers: We’ve got a pair of 2020’s from Pinellas that tossed the piglets around like they were pitmasters from the Carolinas. First up, Clearwater’s Rent Montie. 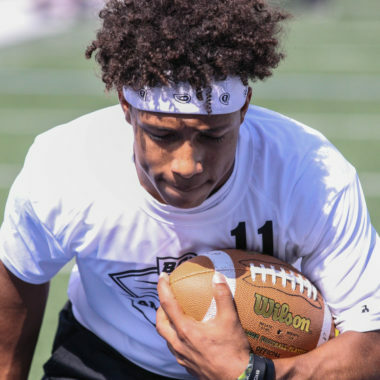 The 6-2/180 c/o 2020 may have thrown the best deep ball out of all the campers according to the tape. His ball location and timing were precise, and was great in 1v1’s. Montie also looked as crisp as our weather in individual drills. Montie threw for nearly 2,500 yards his junior season. Calvary Christian’s Harold Cook looked the part as well yesterday. The young man threw for just over 2,400 yards last season leading the Warriors to the second round of pound-for-pound the state’s toughest region in Class 3A. To quote one of the folks standing there next to him: “he threw the hell out of the ball.” Cook stands at 6-2/195 and while having a very strong performance in indy’s, his performance in 1v1’s was fantastic. Hey! We Know That Name: If it sounds like rising senior cornerback Chendrick Cann from Clearwater bears an awfully familiar surname, it’s because we just saw his older brother Chaddrick toss it around at Dixie Hollins to the tune of 1,400+ yards his senior season and head off to FAMU in 2017. The younger Cann (6-0/155) plays on the defensive side of the ball, and for good reason. Cann showed outstanding athleticism, plus a vertical revealing he has springs in his legs. Cann’s aggressiveness during 1v1’s may have caught the most attention, however. Cann finished his junior season with 34 tackles, 2.5tfl’s, a .5 sack, and an interception. Do the Safety Dance! : Jesuit has a good one coming through the ranks, and his name is Spencer Williams. The 6-0/171 safety registered 40 tackles during his junior campaign for the Tigers, adding a tackle-for-loss, 2 interceptions, 2 passes defensed, a fumble recovery, as well as 4 caused fumbles. Those numbers all add up when you see what he brought to the table on Sunday. Williams possessed good footwork and ball skills, showed great awareness, and perhaps the icing on the cake is his ability to cover in a man-to-man situation. Safety Dance! 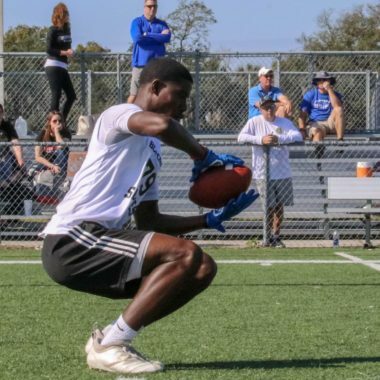 (This is the remix): Tampa Catholic’s Demond Snyder (5-11/165) still has two years left, and we’ve already seen a ton of this young man at camps. Why do we mention that last part? Because we’ve seen a large sample of his skills and he had his best camp by far. Snyder’s confidence was in full-bloom showcasing solid technique in his drills winning the majority of his reps. Snyder finished his sophomore season with just 12 tackles, an interception, 4 passes defensed, and a fumble recovery. Looks like we can expect those numbers to pale in comparison to what 2019 brings if he continues this momentum. When a Wolff Becomes a Wolf: One sibling leaves, another remains. Hayden Wolff is now off to the Commonwealth of Virginia to play at Old Dominion. 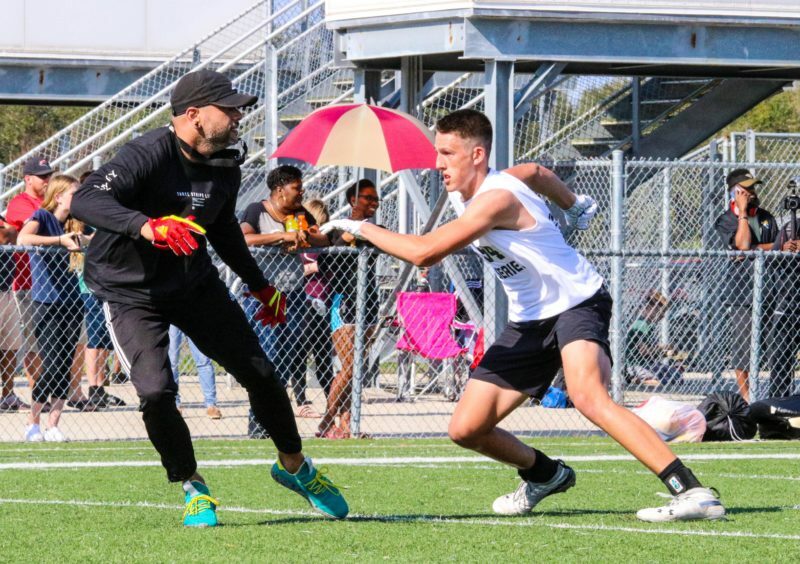 “Little” brother Weston Wolff caused damage up and down Florida’s Suncoast this year, and the 2019 forecast is for more of the same. The 6-4/187-pounder caught 70 passes from his brother for a total of 796 yards and 3TD’s his sophomore season. What Wolff displayed on Sunday was beyond just the physical stuff. On top of his insane body control and supreme route-running, that compliment the clamps attached to his hands, it was the comments regarding his coachability and his humility that bring this young man to a total package status. Given the new district that has Manatee in it, plus an always loaded non-district schedule for Venice this season, we can’t wait to see what 2019 brings for Wolff.